Today Tim Tyler has forwarded us some photos of the build. Sadly he has left his camera at the workshop, so we only have three photos so far. But more will follow. The base plate is now rising from the floor. More photos would have been too much excitement for a Friday evening, we’ll wait for them patiently! The base plate has been cut to the shape of the swim. 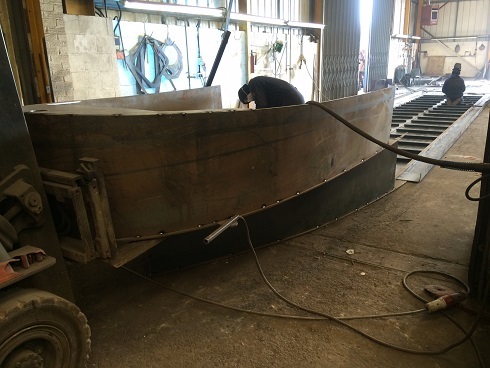 Then the up stand added with the base plate shape of the stern welded to that. The base plate is the slightly browner area of floor, sat on top of it is the start to the hull sides. View from the outside. 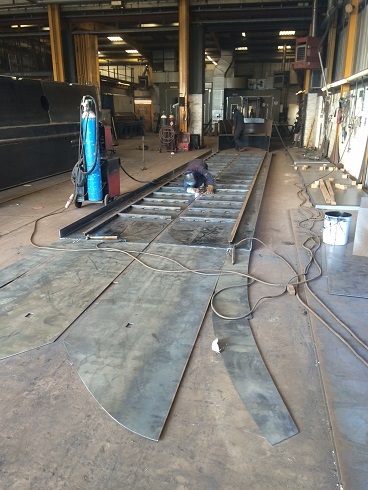 The pieces are spot welded into position to hold their shape. A fork lift has been used to hold the stern in place whilst work continues. The sides of the hull on the floor. These have a 90 degree angle on the outside edge which when stood up will become the gunnels. 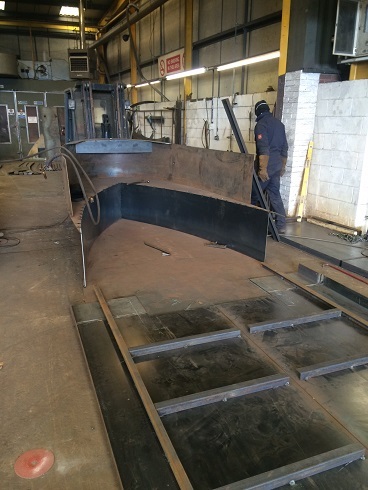 Box section has been welded to the sides for strength and for the battening to be fixed to. Continuing towards the camera the sides have been cut to shape for the bow, it looks a bit like a shirt lying on the floor. The small holes may become the vents for the gas locker which is positioned in the bow, this is in case there is a gas leak then the gas can escape as it is heavier than air. Apparently the hull sides are now stood up. The bow is pulled to shape and guards are on. The cabin and roof will take shape next week. Eeek!! Very exciting. I’ll post more photos when they arrive. This entry was posted in Uncategorized on 18th Mar 2016 by pipandmick.